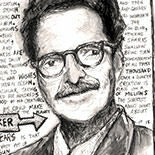 Ernest Becker (September 27, 1924 – March 6, 1974) was a Jewish-American cultural anthropologist and writer. He is noted for his 1974 Pulitzer Prize-winning book, The Denial of Death. The Denial of Death is a work of psychology and philosophy in which the author builds on the works of Søren Kierkegaard, Sigmund Freud, Norman O. Brown and Otto Rank. It was awarded the Pulitzer Prize for General Non-Fiction, two months after the author’s death. The premise of The Denial of Death is that human civilization is ultimately an elaborate, symbolic defense mechanism against the knowledge of our mortality, which in turn acts as the emotional and intellectual response to our basic survival mechanism. Becker argues that a basic duality in human life exists between the physical world of objects and a symbolic world of human meaning. Thus, since humanity has a dualistic nature consisting of a physical self and a symbolic self, we are able to transcend the dilemma of mortality through heroism, by focusing our attention mainly on our symbolic selves. This symbolic self-focus takes the form of an individual’s “immortality project” (or “causa sui project”), which is essentially a symbolic belief-system that ensures oneself is believed superior to physical reality. By successfully living under the terms of the immortality project, people feel they can become heroic and, henceforth, part of something eternal: something that will never die as compared to their physical body. This, in turn, gives people the feeling that their lives have meaning, a purpose, and are significant in the grand scheme of things. Becker argues that the arbitrariness of human-invented immortality projects makes them naturally prone to conflict. When one immortality project conflicts with another, it is essentially an accusation of ‘wrongness of life’, and so sets the context for both aggressive and defensive behavior. Each party will want to prove its belief system is superior, a better way of life. Thus these immortality projects are considered a fundamental driver of human conflict, such as in wars, bigotry, genocide, and racism. Another theme running throughout the book is that humanity’s traditional “hero-systems”, such as religion, are no longer convincing in the age of reason. However, he argued the loss of religion leaves humanity with impoverished resources for necessary illusions. Science attempts to serve as an immortality project, something that Becker believes it can never do, because it is unable to provide agreeable, absolute meanings to human life. The book states that we need new convincing “illusions” that enable us to feel heroic in ways that are agreeable. Becker, however, does not provide any definitive answer, mainly because he believes that there is no perfect solution. Instead, he hopes that gradual realization of humanity’s innate motivations, namely death, can help to bring about a better world. 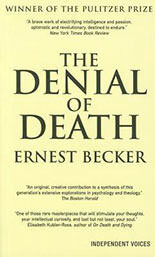 Becker’s work, particularly as expressed in his later books, The Denial of Death and Escape from Evil have had a significant impact on social psychology and the psychology of religion. Terror Management Theory, an important research programme in social psychology that has spawned over 200 published studies has turned Becker’s views on the cultural influence of death anxiety into a scientific theory that helps to explain such diverse human phenomena as self-esteem, prejudice, and religion. "Man cannot endure his own l..."